Remember those old jukeboxes where pub guests could choose a song that was added to the playlist? Well, imagine a party at your house where all guests could do so via wifi using their own mobile devices! In this article I will show you how. They easiest setup is, of course, to run Music Player Daemon on the computer where the music is stored. You install a Music Player Client on your mobile device and connect it to this computer via wifi. A wifi router running the free operating system OpenWRT. We used the TP-LINK model TL-WR1043ND – the one that comes with a USB port. A supported USB sound card (e.g. the C-Media USB Headphone Set (3D SOUND)) and a cable connecting this sound card to your stereo. Storage: You can either plug a USB hub into the wifi router and then connect the sound card and a USB flash disk to it. Or you get your music storage from somewhere else in the local network. This is what I did, so here I’ll talk about a fileserver in the LAN. A notebook or PC to configure everything and to test your setup. An internet connection for the wifi router during setup. To download the appropriate image for the hardware enter your device’s name on the wiki http://wiki.openwrt.org  and search. (It might not be the most user-friendly website you have ever seen.) For the TP-Link TL-WR1043ND I downloaded this image to my computer: http://downloads.openwrt.org/backfire/10.03.1/ar71xx/openwrt-ar71xx-tl-wr1043nd-v1-squashfs-factory.bin. Configure your computer’s LAN interface in a way that it has a fixed IP address: The router probably has got the 192.168.1.1, give your computer the 192.168.1.2/24. Open your browser, go to 192.168.1.1. Find the menu item that allows you to update the device’s firmware. 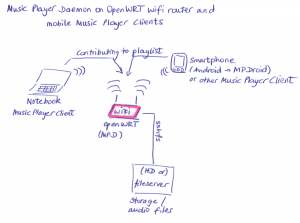 Upload the OpenWRT image via the web interface. It will take a little moment, then the router will be back with a completely different web interface called „LuCI“. That’s OpenWRT. Keep your cable connection to the router and connect a second network cable to it, so that it can access the internet. The router will have to access some directories on your file server permanently via ssh. Let’s create the key and config for this. First, create a user on your file server, e.g. „router“. Edit the file /etc/init.d/mpd and replace the line amixer set PCM 40 with this line: amixer set Speaker 150. You might want to restore your setup automatically, in case you reboot the router. 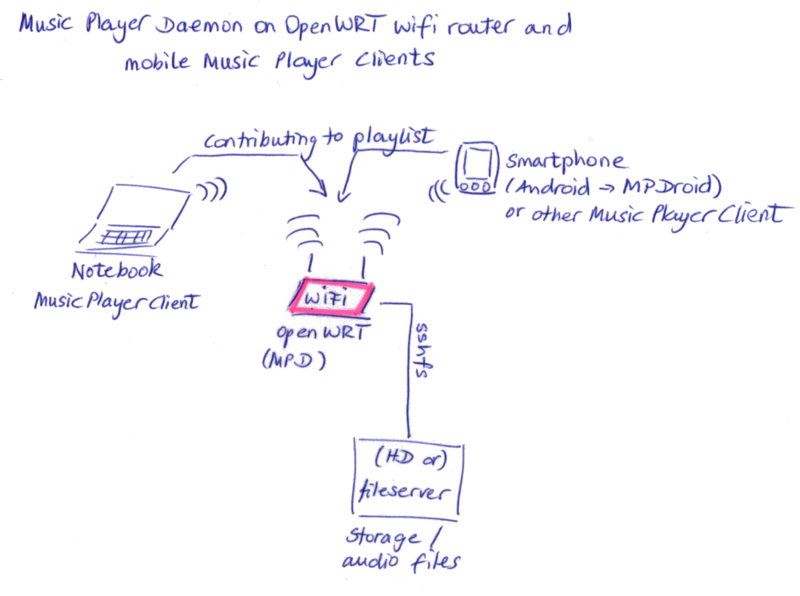 Write a small script that checks if the remote directories are mounted and if Music Player Daemon is running. the file should be placed in /bin/music.sh. Run chmod u+x to make in executable. When you save and quit the file, the new cron job will be installed. They have to install a client app. the password if you set one in /etc/mpd.conf.